I prayed this scripture to the Lord and He faithfully answered. He revealed bitterness and anger lingering in hidden spaces of my heart. He placed His finger on areas of hardness. His touch is tender; it’s gentle; it’s loving, yet heavy and relentless. Confessing this revelation is painful. It hurts. It’s hard to admit the ugliness staining the places I long to be painted with colors of beauty. It’s hard to acknowledge the true condition of my heart when it does not agree with my assumption. So, now I stand with a transformative crossroad laid before me. I could take the path of darkness, of hiding, of suppressing His conviction. The path of pretending that I don’t need His correction. The path of allowing pride and denial to veil the brokenness. I could put on a mask to hide the ugly. I could walk in a manner of counterfeit transparency. I could compromise my relationship with Him for the sake of not appearing what my flesh considers to be weak, immature and unholy. I could make an ineffectual attempt to escape His pursuing. But, this way would only lead to destination misery. How can I walk the path to which I do not belong? I do not belong to the flesh. I do not belong to bitterness or anger. I do not belong to pride. I do not belong to brokenness. I do not belong to a compromised fervor. I do not belong to the hurtful way. I belong to the everlasting way! I belong to the path of Light. The path of confessing the blemish abiding in the corners of my character – even if it’s admission hurts. It’s a hurt that does not exist without purpose. A purpose that takes me from glory to glory. A purpose that conforms me further into His image. This way may be paved with pain and difficulty, there may be fires of refining, there may be storms of trial, there may be mountains of testing – but it leads to destination sanctification. It leads to unspeakable joy, incomprehensible peace and unfathomable love. It leads to Who my heart and soul long for. Therefore, I will allow His touch to soften the hardness. I welcome the fires that burn away ugliness; I welcome the storms that wash away brokenness; I welcome the mountains that build my faithfulness. I welcome His searching. I welcome His pursuit to capture and to hold the fullness of my heart. He may strongly support those whose heart is completely His. 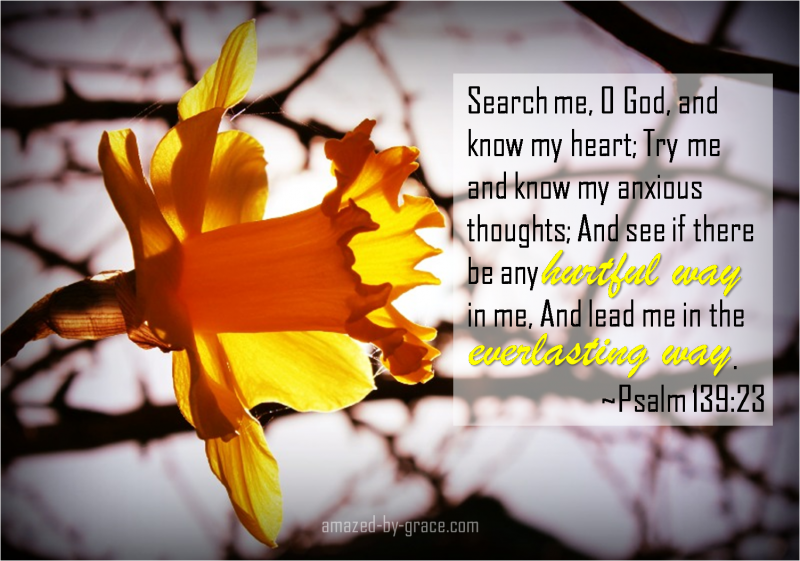 Lord, the cry of my heart is that your gaze would rest on and delight in me! Next Post What Color Is That Dress? – How Are Your Eyes Deceiving You? Just remember that Jesus took all the hurt and ugliness ok n the cross 2000 yrs ago, and its up to us just to accept that free gift of grace knowing we have already been delivered from all negativity in our lives.He did all the work. GOD Bless Ye All Everyone Forever through HIS SON YESHUA-JESUS CHRIST FOREVERMORE! !